Monkeys! A Primate Story is currently running at the National Museum of Scotland in Edinburgh, where it is entitled Monkey Business, and because of its nature is proving to be hugely popular with family audiences. The exhibition explores the world of primates, from the tiny mouse lemur to the mighty gorilla and features 60 new taxidermy specimens created by National Museums Scotland specialists. It also includes skeletons of monkeys, apes, lemurs and bushbabies alongside a host of interactives, film, models and photography. 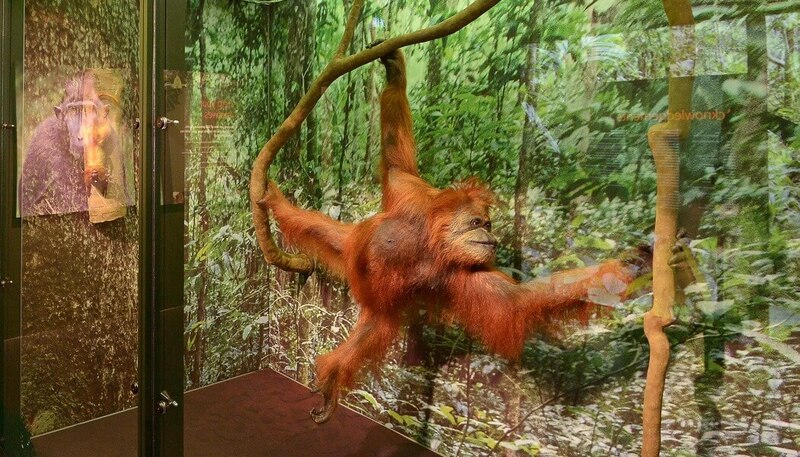 Visitors can discover how different primates move and communicate, how they’ve developed tools to get hold of food and their complex social systems. It also examines the relationship between humans and primates, including the ways in which many species are threatened with extinction through the impact of habitat loss and hunting. National Museums Scotland cares for more than 12 million objects and specimens and are of international significance in their calibre, scope and reach. They illustrate the richness of arts, culture, the natural world, and achievements in applied science across the globe.